Don't you just hate it when you start arguing with someone, heatedly so, only for them to turn around to you and tell you that you're projecting your problems onto them! The thing is, quite often that person is right. You're getting angry with someone because they're displaying qualities you dislike that you know are inside of you. That, my friend, is your shadow. 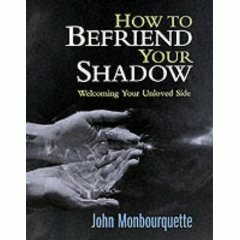 I have to say I had very little understanding of 'shadows' before I read John Monbourquette's How to Befriend Your Shadow and I also think that this book could have been written better - the subject order needs to be changed, to my mind. Still, Monbourquette's book is also a transformational read. Above all, How to Befriend Your Shadow tells you when you're projecting your problems in a conflict situation and when the other person really does have a problem - and that really is worth knowing, in my opinion. Until I read your definition...I was at a loss what this book was trying to convey...to say that this book needs to be rewritten is an understatement. Over my lifetime I have not read a more poorly written piece of literature. Thanks for enlightening me though!